…McCawley’s Brahms is music-making of a very high order and of a highly refined intellect. Arguably Brahms’s greatest and most intellectually concentrated work in variations form, the Variations and Fugue on a Theme by Handel is the perfect vehicle to showcase McCawley’s particular strengths. The work is technically challenging, but, unlike the Paganini Variations, not in a way that invites overt virtuosic display. McCawley’s pellucid playing lays bare the neural synapses that telegraph signals from one variation to another, while it fuses the right and left brain lobes into an organic unity. In other words, not since I reviewed Cynthia Raim’s Handel Variations in 33:2, have I heard a pianist impose such a degree of architectural integrity on the work as Leon McCawley does here. This is a magnificent accomplishment. While a high order of intellect is just what the doctor ordered in the variations, the Waltzes call for some of that typically Viennese schwung and weltschmerz. These 16 short pieces are very much in the tradition of Schubert’s German dances and, at the same time, an expression of the esteem in which Brahms held his contemporary and good friend, Johann Strauss II. Even though they were aimed at popular consumption, the Waltzes speak to a more cultured class than do the earthier Hungarian Dances, and so, once again, McCawley’s somewhat understated sophistication strikes just the right tone. Few pianists I can think of are equally attuned to both early and late Brahms; the music is from different universes, just as are Beethoven’s early and late works. McCawley’s Handel Variations is among the best I’ve heard, and his Waltzes are pitch-perfect. So, for that, and for an excellent recording made in the acoustically ideal Champs Hill hall, McCawley’s disc deserves a well- earned recommendation. Leon McCawley finds a different sound and logic to both of the others [Murray Perahia and Barry Douglas]. In the Handel Variations of Leon McCawley’s recent Brahms recital, there is immediately quite a contrast to Murray Perahia in the 7th variation. The sound is lighter, absorbed in detail, almost micro-managed without tipping over into irritating obsession, and everything is delicately pedalled so you don’t get the sudden surges of sound that can overwhelm some Brahms performances. His journey is well controlled…and the concluding fugue is really effective. In some hands it can sound ponderous: not here. The Op. 39 Waltzes are next and he really is on their wavelength, delighting in subtle shifts of character, played with elegance and affection. The Op. 118 pieces are superbly rendered from the the Lisztian bravura of the 1st through all the passion, darkness and soul searching to the the desolate ending of the 6th. The Somm recording…is perfectly in tune with the clarity and precision of McCawley’s playing. A fine Brahms recital. 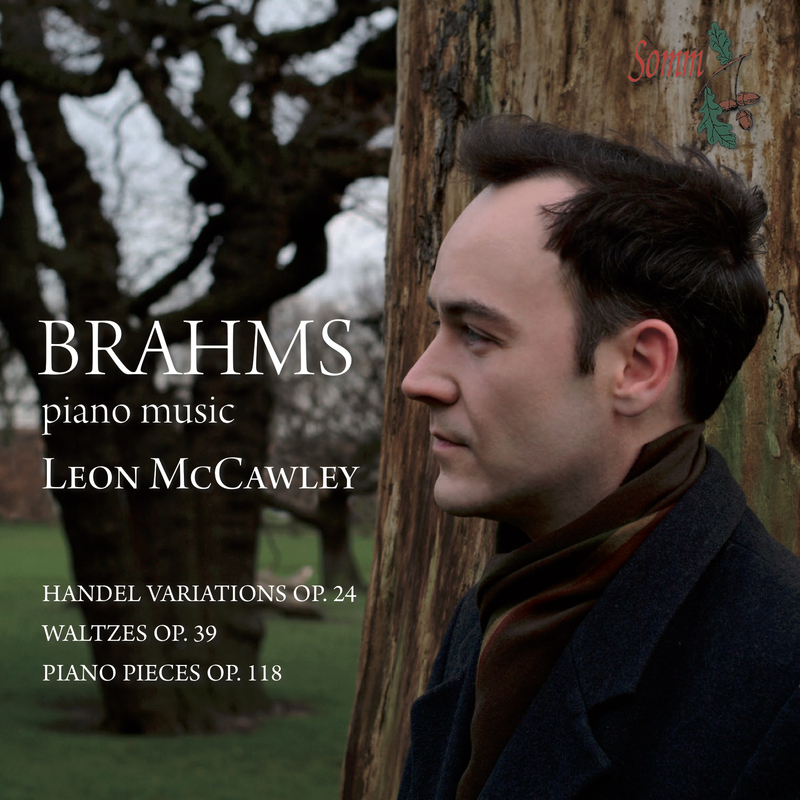 Leon McCawley’s beautifully recorded Brahms recital strikes exactly the right balance between the monumental, intimate and light-hearted aspects of the composer’s piano output. He is especially adept at characterising the sequence of Op. 39 Waltzes, extracting the maximum degree of variety from these deliberately unpretentious miniatures. Among his strengths is the way he imaginatively draws out different nuances the second time the material is heard. It’s a tactic that McCawley also employs to great advantage in the Handel Variations where he approaches the score with a notable lightness of touch: textures and finger articulation are crystal-clear throughout. In Brahms’s Variations and Fugue on a Theme by Handel, should a pianist zero in on the overall grand design and try to build cumulative momentum? Or, instead, focus on the intricate contrapuntal textures and subtle rhythmic felicities? Or perhaps both? Leon McCawley is…[more of] a detail maven. Cases in point: his affectionate accentuations and inner voices in Var 2, the strict adherence to Brahms’s dynamics and articulations in Vars 7 and 10 (easier said than done), Var 16’s carefully voiced canons and the beautiful, bell-like sonorities he obtains in Var 22. McCawley lets his hair down in the Waltzes…retaining plenty of dynamism and passion. However, the Op. 118 Piano Pieces showcase McCawley’s most consistent and inspired playing. Listen, for example, to the A major Intermezzo’s conversationally phrased outer sections, the F minor Intermezzo’s fascinating interplay between the hands (many pianists maintain the textures at a uniform level) and how the E flat minor Intermezzo’s registral extremes seem to emanate from two very different instruments. It is always a pleasure to encounter the musical personality of Leon McCawley. His technique is immaculate yet unobtrusive and renders the most awkward passages gracefully. The warmth of his healthy sound at the instrument is neither fat and plummy nor ascetically lean, but ample and resonant as a bell. Even in dense textures, his keen ear dictates nothing less than crystalline clarity. His musicality encompasses both a cantabile style of true eloquence and a kinesthetic sense as varied as a dancer’s. Moreover, McCawley is a canny programmer, with a knack for juxtaposing the thrice familiar in ways that bring freshness and vitality to music we thought we knew forwards and backwards. His new Brahms CD is a case in point. To begin with, he presents the weighty, intellectual Brahms, fascinated by historical music, in the Handel Variations, followed by its virtual antithesis, the superficially insouciant Op. 39 Waltzes. Then come those six small pieces of Op. 118, their melancholy finally collapsing into despair. Thus, in addition to a richly varied progression of affects, we are given nothing less than a finely wrought portrait: ‘Johannes Brahms, Composer for Piano’. The singular success of these Handel Variations is due, on the most basic level, to McCawley’s stalwart refusal to use too much pedal. The ever-lifted dampers of so many pianists intent on a huge, round ‘Brahmsian’ sound is tantamount to applying layer upon layer of cloudy varnish to a dark canvas, obscuring its already fragile contrasts. McCawley’s more secco approach is just the thing. It imbues his soft sounds with a genuine hush, lends his staccato articulation a detached piquancy and allows him to move when speed is called for. Following the two adjacent B flat minor Variations, Nos. 5 and 6, the seventh Variation, ‘con vivacitá’, is quiet, marked, detached, and ever so refreshingly perky. The chains of parallel sixths in the eleventh variation ­ marked sciolto, free, nimble ­ fairly scamper, and provide the perfect lead-in to the clarion horn calls of Variation 15. If the fugal finale never quite works in pianistic terms, McCawley comes as close to a satisfying finish as any pianist I know. Through some alchemical blend of polyphonic clarity, varied textures deftly juxtaposed and a soaring cantabile despite all odds, near the end McCawley actually causes us to exult in the incessant pealing of the pedal point on the dominant F, rather than be driven to the brink of distraction. For this we all owe him a debt, as I’m sure Brahms would too, were he around to hear it. Though more or less contemporary with pieces like Morning Journals and The Beautiful Blue Danube, Brahms’s 16 Waltzes, originally conceived for piano duet, could not be farther removed from the music of his friend Johann Strauss. Even when dancing, Brahms, like Lot’s wife, simply could not resist the impulse to look back. In the case of Op. 39, his backward glance rests on Franz Schubert, whose dances may have provided inspiration but whose guileless expressivity was inimitable. To paraphrase the Shaker hymn, it was not Brahms¹s gift to be either simple or free. In McCawley’s hands, however, these waltzes exude immense charm and, their occasionally disquieting inner voices and unorthodox harmonic turns notwithstanding, seem imminently danceable. With the Intermezzi, Ballade and Romanze of Op. 118, we arrive at those pure waters of Brahms’s ultimate artistic achievement at the piano, form and content orbiting in a perfectly balanced symbiosis. Whether in the effusions of the first Intermezzo, the tender melancholy of the second, or the sputtering irascibility of the G minor Ballade, McCawley steers a sure and confident course that explores every affective gesture. Brahms’s pervasive ambiguity is made painfully clear, without the excuse of any sentimental overlay. The busy, slightly agitated A flat Intermezzo eventually delivers us to an F major cadence, the key of the gentle, luminous Romanze part lullaby, part prayer, part fond remembrance of happier times. Yet with the inevitability of fate, the last E flat minor Intermezzo steals in, that improvisation on a phrase shaped like the ‘Dies irae’, with its desperate attempt to summon even a distant memory of something heroic, before finally subsiding hopelessly into desolation. Brahms doesn’t get more complex than this, or more terrifying. McCawley takes us there without flinching, revealing every dark recess but doing so with an earnestness and compassion that somehow make it seem bearable. When all is said and done, it is difficult to know whether McCawley’s refined piano playing, his natural yet cultivated musicality or his boundless imagination warrants the greater praise. You must hear the recording, but be warned: you may never want to hear another pianist play Op. 118.